Ever since the beginning of time, people have predicted the end of time. How will it actually happen? Here are the doomsday teachings of five major world religions. 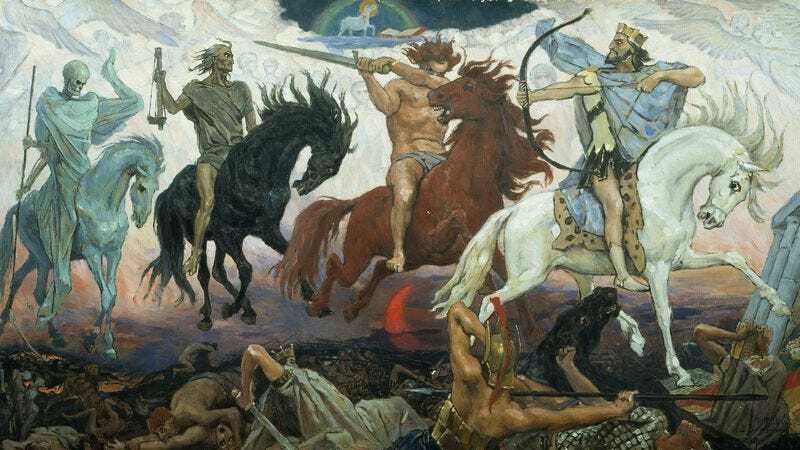 The Catholic Church’s beliefs about the apocalypse stem primarily from the Book of Revelation, which teaches that at the end of the world, a booming voice will announce, “Sorry folks, show’s over!” and exit doors will appear floating in the air all across the planet. When people exit through a door, they’ll find themselves on a busy city street during the middle of the rainstorm, and it will be hard to hail a cab. According to Judaic tradition, the Rapture commences with the recurrence of the 10 plagues of Egypt, followed, tediously, by the same 10 plagues again, and then, as if God had no creativity whatsoever, those same 10 banal plagues happen over and over until finally everyone on earth is so bored of plagues that they kill themselves. This great faith holds that time is cyclical and unending, similar to what Rustin Cohle believes on HBO’s hit show True Detective. There are a few key differences between Cohle’s beliefs and the tenets of Hinduism, but a lot of overlap as well. A light rain falls on a man standing on a nondescript street in a rural farm town. As he turns and walks away, the world starts very slowly fading to black while the credits roll. Next to the word “Director” it says “God,” and listed under “Cast” is every person who ever lived. All the songs recorded during human existence play over them simultaneously. Then the credits for all those songs scroll across the earth. When the credits end, the world ends. Sharks will sprout legs, and it will all go downhill from there.